1. Google anti-diversity memo: Google (GOOGL) CEO Sundar Pichai has condemned portions of a controversial memo sent by a male engineer at the company who argued that women are not biologically fit for tech roles. Reuters and Bloomberg reported Tuesday that the engineer had been fired, citing emails they received from him. A Google spokesperson declined to comment on the reports. In an email to Google employees on Monday, Pichai wrote that parts of the 3,300-word manifesto crossed the line by "advancing harmful gender stereotypes" in the workplace. 2. Disney earnings: Disney (DIS) will report second quarter earnings on Tuesday. Wall Street will be especially interested in the performance of ESPN. The sports network has been dragging Disney down, offsetting the company's many wins in the box office. Declining subscriber numbers and lower ad revenue led to some layoffs in 2016. Disney shares are flat this year despite a major rally in the broader market. 3. China trade slowdown: Chinese export growth slowed more than expected in July, with lower shipments to China's biggest trading partners -- the U.S. and EU, as well as many emerging markets. "Looking ahead, we think further downside to export growth should be relatively limited given the positive outlook for China's main trading partners," said analysts at Capital Economics. 4. 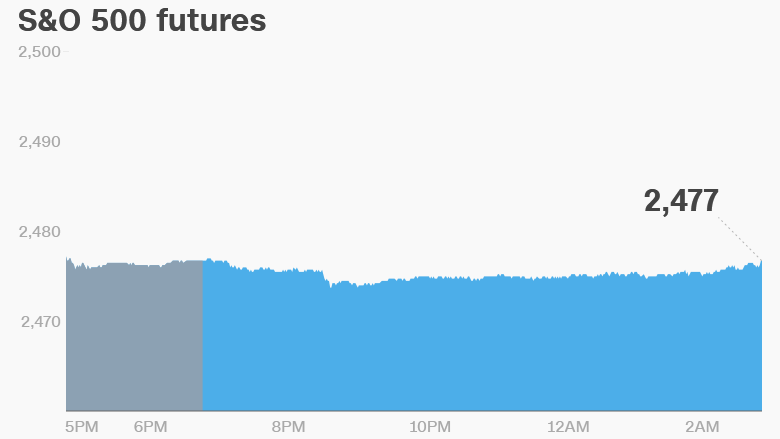 Global market overview: U.S. stock futures were flat early on Tuesday. The Dow Jones industrial average added 0.1% on Monday to close at a record high for the ninth consecutive trading session. The S&P 500 gained 0.2% and the Nasdaq increased 0.5%. European markets were mixed in early trading on Tuesday, while Asian markets ended the session mixed. 5. Stock market movers -- Marriott: Shares in Marriott International (MAR) were down 2% in extended trading after the company announced a new joint venture with Alibaba (BABA) on Tuesday. The service will allow Chinese travelers to book rooms at Marriott hotels on Fliggy, Alibaba's travel service platform. 6. Earnings and economics: CVS Health (CVS), Michael Kors (KORS), Norwegian Cruise Line (NCLH), Ralph Lauren (RL), SeaWorld Entertainment (SEAS) and Tesco (TESO) are set to release earnings before the open. Fossil (FOSL), GoDaddy (GDDY), Hertz Global (HTZ), Priceline (PCLN), Red Robin Gourmet (RRGB), Rosetta Stone (RST), TripAdvisor (TRIP) and Zillow (ZG) will follow after the close. German and French trade data came in below analysts expectations on Tuesday.